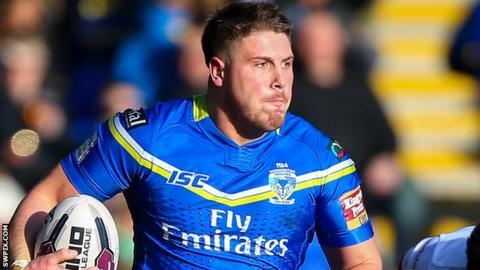 Tom Lineham scored a hat-trick to help Warrington maintain their perfect Super League record by beating Hull KR. Ben Currie touched down Kurt Gidley's chip to put the Wire ahead, before Joe Westerman powered over a second try. Lineham crossed to make it 16-0, despite having Gidley sin-binned, with Iain Thornley then going over to reduce the deficit for the visitors. Two further tries from Lineham and one from Daryl Clark sealed the points, despite Kieran Dixon's consolation try. Warrington ought to have had the game won before half-time, with Westerman and Daryl Clark both held up over the line as the hosts applied constant pressure to the visitors' line. Kevin Penny also looked to have gone over, but the try was ruled out for a forward pass in the build-up. The hosts finally made possession and territory count in the second half, with the result capped off by Clark's tackle-breaking individual run and score late on. Thornley and Dixon's scores were the only highlights for Rovers, who also lost forward James Donaldson to a serious-looking arm injury midway through the second half. "The lead-up play was very good and the performance overall was solid. We had a real mix with some brilliance and some mediocrity. "Our defence was very much on but it was disappointing to concede a second try, although it was a fantastic finish by Kieran Dixon. "We were fairly dominant in a lot of areas but Hull KR stuck with it and kept battling away." "The scoreline blew away in the last few minutes but our effort was first class. "We defended our line really well but were poor with the ball. "You can't afford to give a side like Warrington so much possession, and we need to be better." Warrington: Westerman; Hughes, Westwood, Sims, Clark; Hill, Sandow; Gidley, Lineham, Currie, Evans, Penny, Russell. Replacements: Dwyer, King, Atkins, Cox. Hull KR: Cockayne; Dixon, Thornley, Minns, Sio; Blair, Kelly; Green, Lawler, Tilse, Horne, Clarkson, Allgood. Replacements: Walker, Mulhern, Donaldson, Holker.